Today’s blog article has been provided by Tracy Powley and Stella Chandler, of Focal Point Training and Consultancy. They discuss the impact of inappropriate behaviour within workplace teams, and an upcoming IP Inclusive event that will help you get to grips with this thorny topic.Tracy and Stella write: “Christmas festivities will soon be upon us once more and with an abundance of client entertaining and office parties, it is a prime time for behaviour to slip from the usual standards. ​Against the backdrop of the torrent of recent allegations around sexual misconduct, this is an even more pressing issue to consider this year. Managing inappropriate behaviour at work is one of the areas managers find most difficult to deal with, not just at Christmas, but throughout the year. 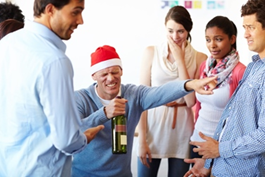 When does “letting off steam” at an office party overstep the mark, for example? When does office banter cross the line from harmless jokes to something more offensive? When does a bit of “innocent flirting” become unacceptable? What are the lines between “firm management” and bullying? Because Partners and Managers find many of these grey areas difficult to address, they often shy away from dealing with them at all. But left unchecked they can really damage morale and performance and often escalate to claims of harassment or bullying. And, of course, inappropriate behaviour can be very excluding, making people feel at best uncomfortable and at worst isolated and powerless. Many organisations have policies in place, a set of values proudly displayed on the website and diversity training for staff. And yet day to day behaviour often doesn’t match these stated expectations. To be a truly inclusive workplace, organisations need to help their people understand where the “lines” are between appropriate and inappropriate behaviour and equip their managers to step in when those lines are crossed. We are delighted to be running a session on 1st February 2018, in conjunction with IP Inclusive and Kilburn & Strode LLP, to help explore and address some of these issues. Dominic Houlihan from the UK Intellectual Property Office will also be joining us, to share his department’s experience of creating a culture where people can “bring their whole selves to work”. Stella Chandler of Focal Point Training will lead an interactive session to help you identify what is acceptable and unacceptable behaviour at work and offer some practical guidance on preventing and managing inappropriate behaviour in teams. Thank you Tracy and Stella for this timely reminder about workplace behaviour. We hope many of our readers and supporters will be able to attend the traning session on 1st February 2018, 16:00-18:00, at Kilburn & Strode’s new London office – it will be particularly useful for anyone in an HR or managerial role. Please do register to attend soon as places are limited.